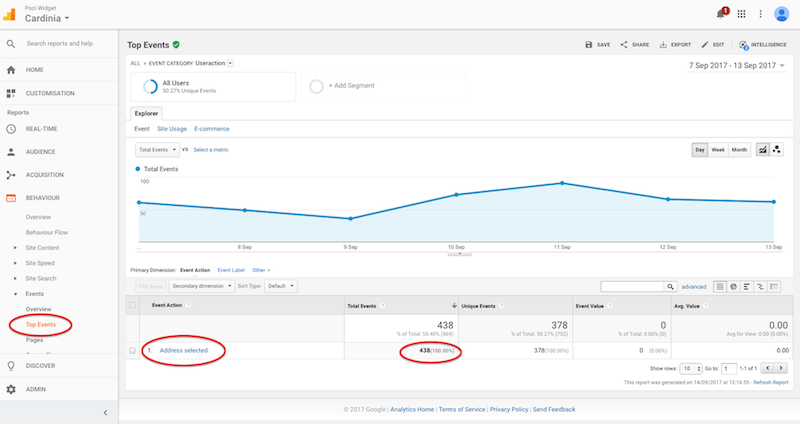 Detailed analytics are available for administrators to view on demand. The first thing you need to do is contact support@groundtruth.com.au and provide an email address that is linked to a Google account. You will then be provided with a customised link to access your organisation’s analytics page. 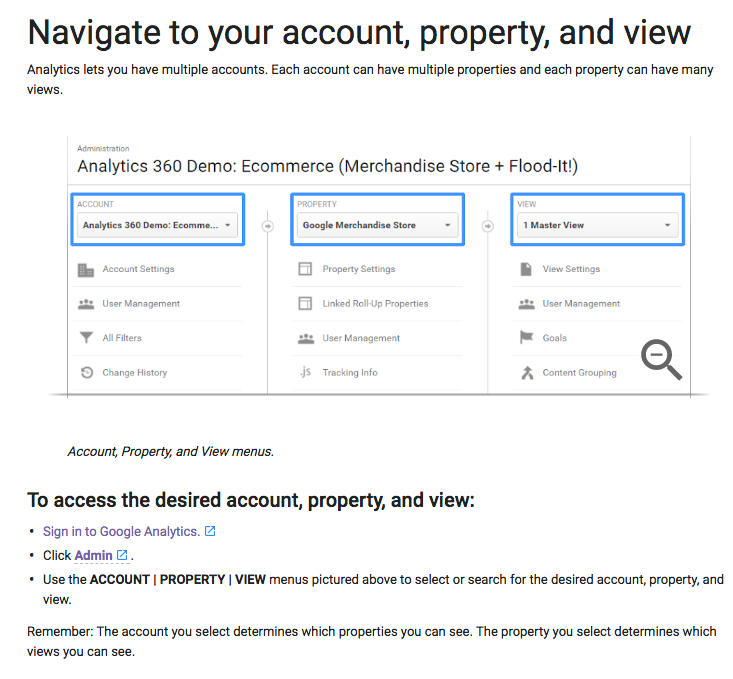 Once you have access to your analytics page you can refer to the Analytics Help page for a brief summary of how to navigate to your account, property and view. 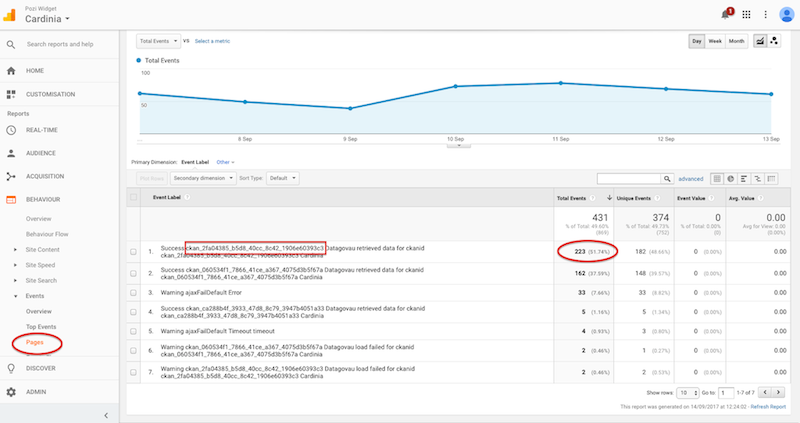 When there is a datasource configured on the widget you can get a breakdown of the specific search counts by looking at the datagovau event. At this point, if you had concerns about a particular datasource your current best course of action would be to contact Groundtruth on support@groundtruth.com.au and provide the corresponding Event Label details. 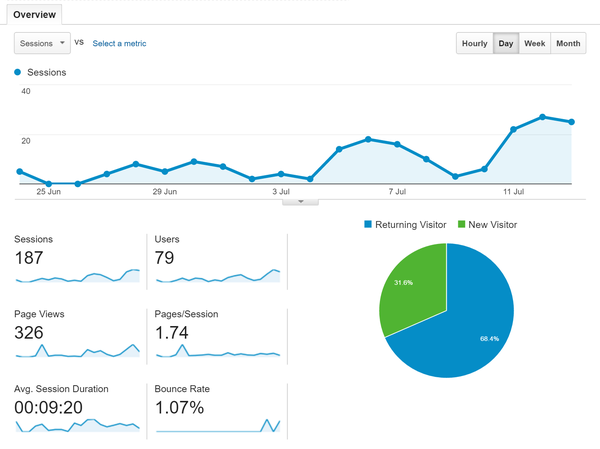 Selecting a date-range at the top right of Google Analytics (eg. July 2018 - today) will adjust the graph display period, and be the reference period for statistics in the tables below it. The smoothness of the graph can be changed to make it easier to read .By clicking the week button (just above the graph to the right), the statistics will be grouped by week, and the graph will not look so jerky with the daily ups and downs. Potentially some useful information is to go to Events->Top Events: and select Useraction. This will give a list of things called Event Actions, some of which are of interest such as Open List, Open Card and Layer Selection. When you click on a property and the property data card is displaying, you have triggered an open card and open list event. If you then click on another data card, say Wards, you will trigger a close card, close list, open card, and open list events. If you then click the X at the top left of the data card to deselect the property (and close the drawer), then only a Layer Control Closed event is triggered, but no closing of card or list events happen. If you then select another property, the events triggered are close card, open list, and open card. It appears that, although the property appears to be deselected when clicking the X at the top left, behind the scenes the data card for the previously selected property is still open. When a user selects a property in Pozi this will trigger the property tab to open as the default data card. This will trigger a Success tab-property event. When the user subsequently clicks on a tab below the property tab, such as the Planning Zones, this will trigger a Success tab-planningzones event. Select Events->Overview: select event label, and then click on full report (bottom right of table). Then at the top of the table you will see a search box. Enter "tab-", which will give you a report on which data tabs were selected and how often. In contrast, the Success Planning Zones is the number of times a user turned on the Planning Zones layer in the layer control (without necessarily having selected a property beforehand). The numbers will correspond to the period selected at the top of the graph, so to compare periods you would change the selected period and note the numbers for the different periods. It is also worth mentioning that the graph shows details for the selected event, so if you click on Success tab-planningzones (for example), the graph will display the changes for that item only. Otherwise it is showing a graph for all the event labels collectively.